I first heard about Nusa Penida Island in Bali in March 2015. And I visited it for the first time in June 2015. The island was serviced by only one boat company and there was no choice but between two hotels. Tourists were rare, the island absolutely wild. Despite pretty rough roads, I discovered absolutely beautiful landscapes. 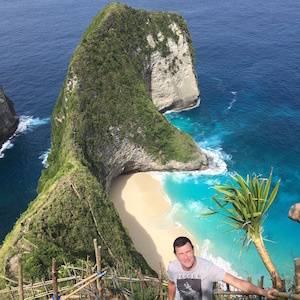 I came back to Nusa Penida 19 times since, and I discovered each time incredible new places. That’s why I wanted to share my discoveries and my favorite spots. And that’s why I created this website. Don’t ask me to guide you on the island, I am not a professional guide. But if you do not find all the answers to your questions in the website I will be happy to try to answer to them if you write me a message at the end of the welcome page ! Have a nice visit and enjoy your stay in Nusa Penida!